1 of 3 In heavy-bottomed saucepan, mix milk, rice, sugar and salt. Bring to a simmer over high heat. Reduce heat to low; cover and simmer, stirring occasionally, 20 minutes. 2 of 3 Add raisins and allspice. 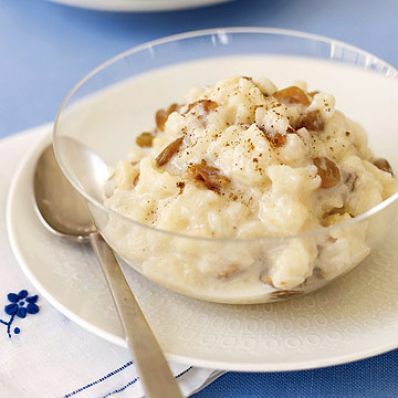 Continue to cook, covered, stirring occasionally for about 25 minutes, until rice and raisins are tender. 3 of 3 Divide pudding among 8 dishes, about 1/2 cup each. Top with a sprinkling of allspice; serve warm.